I'm thinking about buying a Conid regular bulkfiller, but I cannot quite make my mind as to which nib I should choose. The thing is, I like fine nibs: japanese fines and western extrafines, they allow for a safer writing with lower quality paper and my handwriting is fairly small. For good paper, beautifully shading inks and out-of-work writing I absolutely love soft or semi-flex nibs, my Pilot Justus 95 F is now my favourite pen in my collection (pelikan M800 F, lamy 2K EF, Pilot Custom 92 F and a TWSBI VAC 700 F). I guess that kind of settles it in a titanium EF nib. My question is, is the custom grind worth it's price? There's a Namisu Ixion with an EF No 6 titanium Bock nib coming home in a few weeks, so I can swap the nib without any problem. So, is the Conid EF grind noticeably better than the Bock factory EF nib? Maybe it's a bit stingy on my part, but for 100 bucks I can get a brand new Diplomat Excellence which makes for a great gift, or quite a few bottles of ink. Also, a steel fine smooth italic feels like a better deal if I'm going to ask for a custom grind. PD: can you ask for a titanium grip section instead of the standard options? Why don't you ask Fountainble the maker? He grinds nibs also....gave me a butter smooth 1.0 Stub from a fat and blobby BB 600's nib. Too bad all you know is the cheap Bock nibs (like Twsbi)....they do make them in 5,000 lots the way the buyer wants. Check my Signature, about Bock. The customer is King, and that is not you. Bock is a wholesaler. I have vintage Bock nibs that are quite good in either semi-flex or regular flex. I only buy a new pen when the moon is Green, in there is one to two Blue moons a year...with luck. Bock use to make Pelikan's nibs....the complaints then are the same complaints still given to the new in-house Pelikan nibs. If you like EF stay away from Semi-flex nibs....in you might be heavier handed than you know and it would write like a western F ...unless you have a very light Hand. Unless your Pilot pen has a cut out nib....I don't think they are semi-flex. Soft is not the same. Thank you for the reply, I will probably ask him about the matter. I see I was mistaken, I thought Bock nibs were all equal or standard and you just ordered batches of their nibs. As for the semi-flex, I haven't really tried any flex or semi-flex nibs, I was talking about a degree of springiness or softnes, so I stand corrected. Mi hand is, indeed, a bit heavy, but I'm trying to improve it. What the justus allows me to do is use an extra fine dry nib for small writing on cheap paper, and a bit of flare and wetter fine writing for signing, page titles and such. As far as I know the titanium has some flexibility and spring without being true flex, which is good because I don't know how to write with true flex nibs. I'll ask Fountainbel about this, and also about my Pelikan M800 nib, which I don't particularly enjoy. It's too hard and characterless to be interesting and too thick and wet to be truly useful (for me, of course). But I love the pen otherwise and I'd like to have it tuned for usefulness or enjoyment. Good, my signature covers semi-flex a bit....I think one should have a regular flex nib, before heading into semi-flex. First the regular flex gives you a start with a springier nib, and is good for shading inks. Semi-flex is wetter, demanding a better ink and paper match to also have shading with it's line variation. Richard binder's com, is the bible of fountain pens, nibs, filling systems; good advice on inks and so many pretty vintage pens. It will take you some three days to read through. Once 96 1/2% of all I knew was from that. Now it's only 92 1/2% in a decade one should learn something. When I was 'noobie' I thought only house made nibs could be any good. I even was going to toss a Degussa and Bock nib.... In I had never heard of them. There were many good nib makers, along with the run of the mill. There is a world of difference between SEMI-flex and superflex nibs. I like superflex as a term, in it is more precise than "flex". There is besides semi-flex, a maxi-semi-flex nib, between semi-flex and superflex. Semi&maxi are often on German vintage pens. Regular flex, semi&maxi are in a 3 X tine spread set. Superflex 4, 5&6 often, and rarely 7X tine spread with less pressure than semi&maxi. I do have rants on that in many places, so will not get into it right now. Stub and CI is 100% line variation always, semi-flex is line variation on demand. (another fine poster came up with that saying. Do give a picture of how you hold your pen to Fontainble.....especially if you are thinking CI. Stub gives nice line variation, CI demands more precise nib placement. Pelikan makes a dry ink (4001 is I believe dryer than Edelstein) , so makes a wet nib to balance that. First try a dry ink with your 800, like any of the Pelikan inks. What ink(s) are you using in your 800. Often folks using wet or supersaturated inks complain that Pelikan writes too wide, when the ink is at fault. Waterman made a wet ink for a dryer, thinner nib. Now many Noodler users think Waterman a dry ink...................so a wet ink is going to make your 800 write wide. Edited by Bo Bo Olson, 23 November 2017 - 15:15. I have read a bit of Richard Binder's website, but I'll give it a thorough read. Maybe I'll learn enough about vintage pens to try and buy one with a flex nib. The problem is, I can find reliable and abundant info about today's pens and make an informed purchase even without trying the pens, but with vintage pens is quite a bit harder and I don't really know anything about which models are good and whether I'm making a great buy, or a stupidly bad one in terms of price. I was also fiddling with the idea of swapping the twsbi nib for a Zebra G for trying a really flex nib in a fountain pen, don't know if that's a good idea, but it's well worth a try. 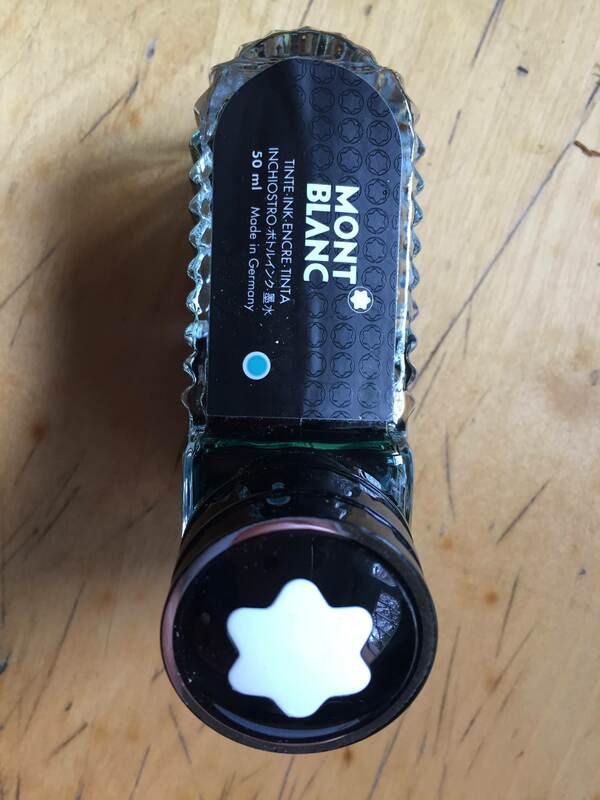 As for the M800 and the inks; I'm mostly using it with Pelikan Edelstein Topaz or Sapphire, tried it a bit with some Montblanck green ink (https://i.imgur.com/uDzcY15.jpg) whose name I don't know. All of them were pretty wet. The only non-edelstein Pelikan ink I have is the blue black with a bit of iron gall, I could try that one in the pen. Or maybe Rohrer and Klingner Salix, which is my favorite everyday ink. Edited by Antonio90, 23 November 2017 - 15:30. Each individual Bock nib Is thoroughly tested and fine tuned by Conid, a writing test report is enclosed for each individual nib. Installing a titanium grip section is possible, but comes logically with an extra cost . """"is the blue black with a bit of iron gall, I could try that one in the pen. Or maybe Rohrer and Klingner Salix, which is my favorite everyday ink."""" Both would do just fine in narrowing the line. That would be MB Irish Green a very good shading green-green = R&K's Verdura. You do need 90G or + laser paper to get any shading. 80G Rhoda is good too, but regular 80g copy paper is not good enough. If you don't put the twice as expensive 90g Laser paper in the printer....a waste, a ream will do you a number of years of fun at home. I find Edelstein inks to be towards the middle like MB....but I don't do a lot of looking for the thinnest line I can get, so can't tell you if MB is the same wetness or wetter than Edelstein. In Inky Thoughts there should be someone who can. ""I was also fiddling with the idea of swapping the twsbi nib for a Zebra G for trying a really flex nib in a fountain pen, don't know if that's a good idea, but it's well worth a try."" A number of folks have done that.....the Zebra G, is perhaps comparable to Wet Noodles, but is not a real flexible dip pen nib. It is a start. Later see if a Hunt 99-100-101 would fit, they make a wet noodle look uncooked. Could be a regular dip pen would do fine. 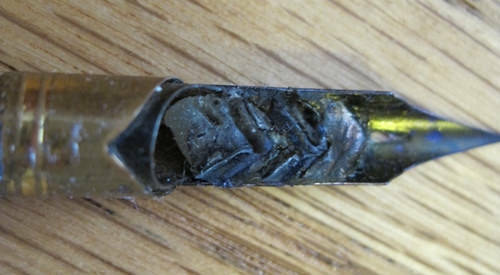 This picture was given to the Com by someone who discovered if you take pure beeswax, and warm it it will fit the nib as a feed and you can cut the 'combs' your self. ( so immediately I went out and bought a pure beeswax candle.....that is still unused. Modern (after 1965 for Pelikan...'70 for Geha and MB or others of that era) obliques have too little line variation compared to semi&maxi-semi-flex nibs. I see too little line variation even in regular flex nibs to make it worth while. I trans-mailed some Pelikan 200's obliques to England for a pal, in there are some Germans who refuse to mail out of Germany. I even have a W.Germany 200, whose nib is a slight tad more springy than the later Germany 200's nibs, and it did not do the trick. Modern Oblique is good if one is left eye dominate or a left hander. Put on your list to buy German semi-flex Obliques of the '50-60's. :puddle:I have 13 in a mix of semi&maxi. There is also @ 15 & 30 degree grinds from that era. I have OBB, OB, OM and OF in both grinds. The 30 degree does give more pattern of course. Pure luck if it's 15 or 30 degrees. Mauricio sells superflex pens, not cheap, but he sees exact fitting of the nib and feed into the pen as the best way to get the best results. It's a lot of fiddling work, and he is experienced; and it still is a lot of fiddling work. But....to get best use one needs to get a book on how to draw the letters. Dip pen nibs are cheap and if you bust one it is no big deal. It takes quite a while for some....like me to lighten one's Hand, and learn how much stress a nib can take.....to judge how wide to test the nib at. I strive to never max a nib. Richard has a great article on that. My post-war Pelikan 100n, will give a 5 X tine spread to a light down stroke and I try not to take it more than 4 X. That Waterman that goes EEF-BBB, I try to keep it no wider than BB. Richard's article really opened my eyes. I always advise working one's way up the flex ladder....regular flex, then semi-flex for a while until the nib is not maxed all the time, before looking for more flexible nibs..............dip pens accelerates the process. It also shows will you put in the work to make a superflex nib worth while. I don't put in the work, so I don't have the fancy the nib could give me. Edited by Bo Bo Olson, 23 November 2017 - 17:56. Thank you very much Fountainbel! I've already placed an order asking for the titanium grip section and an EF titanium nib. Glad to know the nibs are tuned and inspected by an expert. And Bo Bo Olson, I'll use the Rhodia R I have here with that ink then, the oxford optik does also a good job with fp inks usually, and is the one I use daily for studying. I'll order a Zebra G nib and try those inks. Hopefuly they'll make me want to use my M800 again. I added a bit to the last post. I like Oxford Optic, having a spiral notebook of that....at one ink better Clairefontaine Velote 90g is just as good. One of 20-30 inks was better on the Velote. But I'd buy Oxford Optic 90g in a heart beat. Sorry for the delay in answering: a lot of studying to be done here. I've tried the pelikan 4001 blue-black, which I love, and it does thin the line, now I'm enjoying it way more. Thanks! I also have a couple of pure beeswax candles here (I absolutely love the way they smell, both before and during burning), by making a feed out of it do you mean swapping a nib's stock feed with wax to fit a dip nib? or to use it as a reservoir in a dip nib holder for calligraphy? I'll have to try it anyway. Also, I'm pretty confident that, with a lot of work, I could copy some feed design and carve it out of a plastic rod with a dremel, x-acto knife, and an evening near the chimney hearth this christmas. that could result in a nice nib swap for the conid bulkfiller or the Ixion titanium. I'll certainly put 50-60's german nibs on my watchlist. Moreso now I've just tried a wonderful MB nib from those years. A friend of mine happened to have one of these as his daily writer and I could write some lines with it this saturday. As for now, my pen budget is in it's bare minimum, so I'll buy a bunch of dip nibs and start trying stuff with the dremel and the beeswax. At least in the time between my job and my exams, which is quite thin I'd say. I'm now learning spencerian cursive, so I guess I'll be able to put some of that juicy flex to use in a few weeks. Thank you very much, that's a tad of info and greatly appreciated.